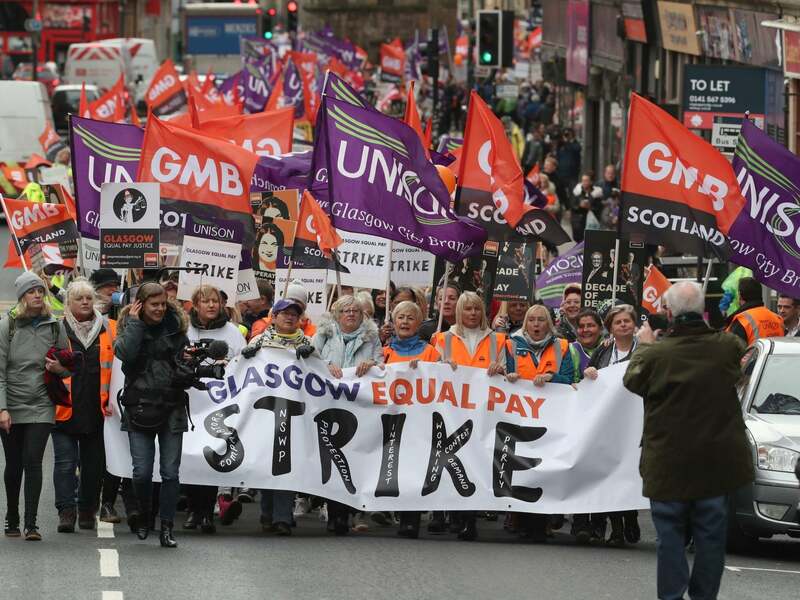 In UK workplace-related news, the 30th of October saw simultaneous precarious workers’ demos in London and Glasgow, while security guards at the Ministry of Justice, organising through the grassroots UVW union, have just voted to strike for a living wage. There was a massive strike for equal pay by council workers in Glasgow on the 23rd and 24th, although it’s surprisingly hard to find much in the way of radical analysis of the situation – there’s a write-up on the IWW Scotland site looking at the SNP’s attempts to shift blame onto past Labour councils, and the Morning Star have an article on the council’s attempts to use legal threats against strikers, but I haven’t seen much beyond that. Post workers in Maidstone apparently followed in the steps of those in Wigan by staging a wildcat strike in defence of a victimised colleague, but again it’s very hard to find anything in the way of coverage. The RMT’s “keep the guard on the train” dispute continues with regular action every Saturday on Northern Rail and strikes also continuing on South-Western. They’ve organised a series of meetings throughout November in Leeds, Sheffield, Newcastle, Manchester and Liverpool (spanning the entire length and breadth of the civilised world, in other words), and the New Syndicalist blog recently put up an interview about the dispute. The RMT are also balloting for action on the Paddington line over the victimisation of one of their members. In broader UK social struggle news, the Stansted 15 trial continues, although the court’s been having a break for a few days now, and Bristol recently saw both mass resistance to a Home Office immigration raid and a successful eviction defence that drove bailiffs off. Coming up, an environmental group called Rising Up/Extinction Rebellion are calling for actions on Halloween and in November – their perspective seems a bit stuck in a dogmatic “non-violent direct action” mindset, but any attempt to revive mass action against climate change has to be welcomed. The film Nae Pasaran!, telling the story of the Scottish factory workers who took on Pinochet, is finally getting shown in some UK cinemas. There are upcoming anti-fascist callouts against the “Frontline Patriots” in Liverpool on November the 3rd and against the far-right German party Alternative fur Deutschland, who Oxford university debating society dickheads have invited because they love doing that sort of thing, on the 7th. The Anarchist Communist Group will be hosting an allday discussion event in London on the 3rd. Finally, a quick look at some international repression news: the International Anarchist Defence Fund have produced their second quarterly report and are asking for volunteers across the world to help share information relevant to their project, four Food not Bombs activists have apparently been killed in the Phillipines, with another jailed, Palang Hitam Indonesia report that some of the Yogyakarta May Day prisoners have been released, and encourage people to send messages to the remaining prisoners via their email address at civilrebellion@riseup.net. In Mexico, anarchist prisoner Miguel Peralta has now been sentenced, while the Rupression project continues to provide updates on the attempted frame-up of Russian anarchists and anti-fascists. Up in the US, the prisoners targetted for alleged participation in the Vaughn rebellion are now on trial. Lucasville inmate Greg Curry has written a statement of solidarity, and has also now been moved out of the supermax, while his fellow defendant Keith LaMar has written a statement responding to the state’s attempt to execute him, as well as the Kavanaugh hearings. Jason Walker has written a new expose on abusive staff in the Texas prison system, while fellow Texas prison organizer Keith “Malik” Washington has gone on a hunger strike after being subjected to unbearable conditions in an attempt to break his spirit. This entry was posted in Anarchists, Climate Change, Housing, Protests, Racism, Repression, Strikes, Unions, Work and tagged ACORN Bristol, Anarchist Communist Group, CWU, Extinction Rebellion, glasgow, Greg Curry, Indonesia, IWGB, Keith "Malik" Washington, rmt, Stansted defendants, United Voices of the World. Bookmark the permalink.